Congratulations on your nomination to be on the Federal Reserve Board. What an honor for you! God bless! I have great respect for The Heritage Foundation. I am always happy to see those who are affiliated receive positions within the governing bodies that can help us shore up the weak areas. Congratulations on your nomination to the Federal Reserve Board. Congratulations!!! We are grateful for President Trump’s choice to nominate meritorious experts for important positions and that he recognized your qualifications for this role on behalf of all Americans. Congratulations Stephen on your nomination to the Federal Reserve Board ! The President made a wise choice . Congratulations, Stephen Moore! I think you will be a tremendous asset to the Federal Reserve Board! This is a great appointment! Steve will act in ways to keep the dollar strong and will not overly cut rates or overly raise rates as the Fed has been wont to do in the past. Congratulations on your appointment Stephen! We are blessed to have a conservative on the Federal Reserve Board! Congratulations Steve. You might remember that at the Friars Club, I recommended that Heritage provide Trump with candidates for the vacancies on the Fed. I am glad that you were selected. A real qualified and capable economist Mr. Moore will be a voice for real positive economic principles. Wishing you the best in your new undertaking. I am sure your input and guidance will be right on. So very thankful for intelligent, committed conservative-minded people who love this country being willing to be on the front lines of doing what is best for all Americans. Wonderful appointment for you Mr Moore,we need more like you. President Trump has made an excellent choice, and I’m happy to congratulate Stephen Moore on his new position. I think Steve is an excellent choice but I read the other day he has an obligation that would be a cloud over his nomination if not taken care of before confirmation. I have a lot of respect for Steve and know if confirmed he will serve our country well. Congratulations! And many, mighty thanks for Trumponomics. Clean up the Fed per “Fed Up”. I support the nomination of Mr. Moore; He’s a good man for the job. 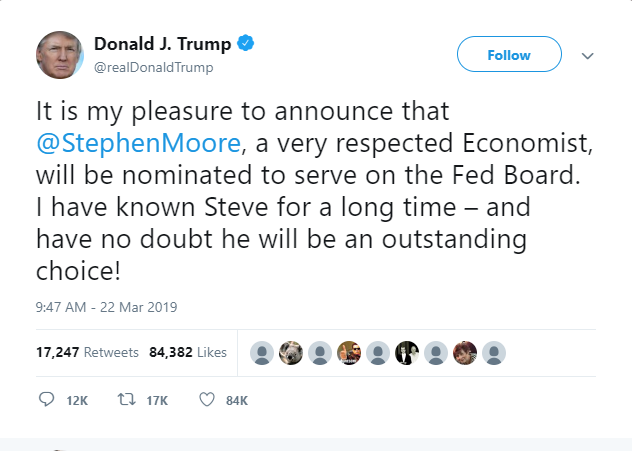 Congratulations, Steven on your nomination to be on the Federal Reserve Board. Way to go Mr. Moore and President Trump. I love listening to Steve weekly on KSFO. Congratulations Steve for nomination to be on the Federal Reserve Board. I can’t think of anyone more qualified than you! God bless you. Heritage is having extraordinary success getting its people appointed to top government positions. This is an amazing time. Congrats! Congratulations Mr. Moore on your nomination to the Federal Reserve Board. Great honor and great responsibility!